Angers – Rennes predictions, betting tips and preview 29 Nov 2017 – The hosts will finally get home win! 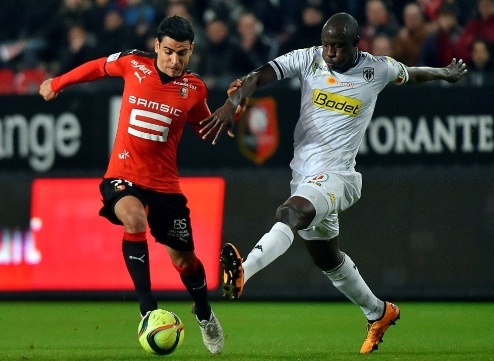 Angers – Rennes predictions for France Ligue 1 match at Stade Raymond Kopa, Angers. The first victory at home for Les Scoïstes. Read on for live streaming info and our free predictions. Do you want to watch live streaming of Angers – Rennes and bet live? Go to bet365 Live Streaming and place winning bets! Angers started this season above praise, and while there were no big victories, on the other hand, the team had a tough schedule, but successfully managed the streak against the league strongest clubs. Bordeaux, Marseille, Saint-Etienne, Lyon – no one could beat Angers, however, a large number of draws did not bring needed positions and now the club are among the outsiders in the risk zone, despite the fact that they have lost only 4 games so far! Last weekend, Les Scoïstes suffered their first away defeat in the season, all the other losses were at home, and if 0-5 against PSG makes sense, then the wins of Metz and Toulouse at the Stade Raymond Kopa were a real surprises and unacceptable results. Angers grab only two points in the previous 5 games, although they lost only once in nine rounds before. It’s hard to say that the hosts are in crisis now, so today we can count on success and the first victory in front of their own crowd. Angers have serious difficulties in defence, because they conceded two or more goals per game in five of their last eight rounds. However, today Rennes comes to visit, a team which also has huge problems, but in the attack, so the hosts have an excellent opportunity to interrupt a series of failures at Stade Raymond Kopa, because the Red and Blacks managed to score more than one goal only once in their last seven matches. Angers have lost only one game more than Monaco, but at the same time, they are one of the outsiders! It’s time to go to the mattresses and show their best football – the hosts will get long-awaited home three points.